These are the Secret Hotels uncovered in Amsterdam, Netherlands (updated Jan 2018). Please send an email or leave a comment if you need help with a secret hotels that is not listed below. This attractive 4-star hotel is located near Amsterdam's Central Station. It features an indoor pool area and sauna facilities . The rooms are decorated with warm colours and large windows. Each room has a private bathroom with a bath, air conditioning and coffee and tea facilities. WiFi is available in all areas and is free of charge. Combining contemporary and classic styles, this 4-star hotel is only a short walk from many of Amsterdam’s major sights, including lively Dam Square. The hotel offers free wi-fi and you can work out in the hotel gym, relax in the sauna and solarium and treat yourself in the stylish bar and restaurant. This luxurious 5-star hotel is situated in a completely renovated 17th century building located between Dam and Rembrandt Square. Its facilities include free wifi, a 24-hour front desk, and an on-site restaurant. The recently refurbished rooms are stylishly decorated and feature free wifi, satellite TVs, minibars, coffee/tea makers and bathroom amenities. A peaceful spot in the heart of Amsterdam, this boutique 4-star hotel is found in an 18th century townhouse near the Vondelpark and museum quarter. A buffet breakfast is available in the mornings, and you can enjoy drinks and light meals in the cool lounge or attractive garden. The hotel’s contemporary style rooms have wi-fi access, a flat-screen TV and private bathroom with rain shower and selection of luxury toiletries. Set within the city's bustling South Axis business district, this modern 3-star hotel is close to The Amsterdam RAI Conference Centre, many of the city's main finance firms and excellent transport links. Enjoy complimentary breakfast before heading out to explore the city sights such as the Van Gogh and Anne Frank museums, Vondelpark, and Amsterdam's picturesque streets and canals. Relax with a drink in the hotel's lounge bar, before visiting one of the many excellent restaurants nearby. Located in the heart of Amsterdam city, this 4-star hotel offers a mix of 15th-century architecture with a warm and modern décor. Dam Square, Amsterdam Museum and the famous Red Light District are all just a short walk from the hotel. The hotel employs multilingual staff, offers complementary newspapers in the lobby and has flatscreen TVs in every room and free wi-fi throughout. The restaurant is an intimate and unique place to meet and dine. On a pedestrian-only street, this stylish hotel in a modern building with a 17th-century annex is a 7-minute walk from Amsterdam Central Station. Vibrant air-conditioned rooms with traditional furnishings and contemporary accents feature free Wi-Fi and flat-screen TVs, plus leather armchairs and coffeemakers. A breakfast buffet is available for a fee in the modern atrium breakfast room. Found in the heart of Amsterdam, close to Rembrandt Square, this modern 4-star hotel is an ideal base for exploring the entire city. You can benefit from the hotel’s free wifi, a 24-hour reception and a shuttle service that runs to Schiphol Airport from the hotel. Overlooking picturesque Singel Canal, this smart 4-star hotel is a short walk from iconic Dam Square in central Amsterdam. You can explore the retro shops and cafes in the area or make use of the hotel’s bicycle rental to head further afield. Free wifi is available throughout the hotel and the rooms have contemporary furniture. This hotel will reopen again in Spring 2016 after a complete renovation. Found in the heart of Amsterdam’s fashion and museum district, this boutique 4-star hotel combines classic 18th century architecture with contemporary interior design. The hotel’s restaurant serves contemporary, seasonal menus, celebrating the best of Dutch ingredients, and you can relax over a drink in the inviting bar. The hotel’s rooms are air conditioned, and have free wi-fi, as well as tea and coffee facilities, and private bathrooms stocked with luxury bath products. Close to Schiphol Amsterdam Airport, this modern 4-star hotel has great links to Amsterdam city centre and other major Dutch cities. You can relax in the hotel wellness centre with a sauna, Turkish baths and swimming pool. There’s also a restaurant, bar, garden, terrace and free wifi onsite. Combining cool contemporary interior design with traditional 19th century architecture, this 3-star boutique hotel sits in Amsterdam’s Museum Quarter, close to the Van Gogh and Rijks museums. Start the day with a complimentary breakfast and unwind in the trendy bar. The hotel’s stylish rooms include free wi-fi, a TV and safe and a selection of bathroom products. This 3-star Boutique Hotel is Unique and Fresh. It combines historic features with a modern twist. All rooms are equipped with a flat screen tv and an iPod docking station. There are also a minibar and coffee/tea making facilities. The bathroom is fitted with a bath or shower and bathrobes are provided. In the direct surroundings of the hotel you will find loads of local bars and restaurants. Found in Amsterdam’s stylish Oud Zuid district, this modern 5-star hotel sits near the Nooder-Amstel canal. Take advantage of free wi-fi in the hotel’s public areas, or enjoy a cocktail on the bar terrace along the canal. Each spacious room offers great views over Amsterdam, and includes a flat screen television, access to the mini bar, and free coffee and tea. This modern 4-star hotel is a short walk from the city’s cultural highlights including the Van Gogh Museum and Rijksmuseum. Stay here to benefit from 24-hour room service, fitness centre, a restaurant, bar, garden and free wifi. The smart en-suite rooms come with air conditioning, a flat screen TV and free wifi. This 5-star hotel is a short walk from Dam Square, right in the heart of Amsterdam. Bridging the gap between traditional Dutch heritage and modern amenities this hotel includes free wifi. After a day of cycling around Amsterdam, you can relax in the hotel’s well being centre which includes a sauna. This stylish boutique hotel perfectly encapsulates the Netherlands’ trendy nature with a chic design throughout. It’s also centrally located close to a host of popular attractions and lesser known sights that are sure to impress. A memorable dining experience is served in the restaurant, while a relaxing lounge adds home comforts to your experience. At this TripAdvisor Certificate of Excellence winner the high-speed wi-fi is free and the rooms include a flatscreen TV. Ideally located right behind Dam Square, this historic 4-star venue puts you within walking distance of the city’s main highlights. The square itself is home to various bars, food stalls and shops for you to sample, and there’s seemingly always something going on here. Free wi-fi can be accessed in each spacious and stylish room. The recently renovated brasserie offers delicious lunch and dinner dishes plus a great selection of wines and beers. This modern 5-star hotel stands close to Dam Square, in the heart of Amsterdam. Keeping its original historic exterior, inside you’ll find a more modern style. There’s plenty to keep you entertained during your stay including a restaurant, bar, sauna, gym and free wifi. Take a trip on a canal boat, visit the Van Gogh Museum or do a spot of shopping: this 5-star Art Nouveau style hotel is perfectly placed for such adventure. The interior reflects the building’s rich maritime past, each room uniquely furnished to reflect a bygone age. Every comfort is attended to, including free wi-fi and free mini bar, Nespresso machine, fluffy bathrobes and cable TV. Enjoy unlimited access to the lavishly designed Spa and Wellness Centre with sauna, steam room and indoor pool. Found in the north of Amsterdam with a free shuttle service to the city centre throughout the day, this modern 4-star hotel makes the ideal base for exploring Amsterdam city centre and the quieter surrounds. Feel energised with a workout in the hotel gym or visit the lounge bar for a drink or snack. This modern 4-star hotel is situated on the south side of the city, close to the RAI railway station and a short walk from Albert Cuyp Market. Its smart, air-conditioned rooms include satellite TVs, DVD players, tea and coffee making facilities, seating areas, and minibars. Located in the heart of Amsterdam's business district you will find this modern 4-star hotel, right by the Amsterdam RAI Exhibition and Convention Center and the WTC. The RAI train station is only a short walk away and offers frequent connections to Amsterdam city center and Schiphol, making the hotel ideal for both business trips and weekend breaks. We have renovated our entire ground floor, and to offer an even better service, we have expanded our meeting, restaurant and fitness facilities. This 4-star hotel sits close to leafy Oosterpark in the east of Amsterdam. You can relax in the onsite restaurant, lounge bar, garden or terrace. Or, hire a bicycle from the reception to explore the city and surrounds at your own pace. This 4-star design hotel in the trendy area of East Amsterdam features regular contemporary art exhibitions and a classic interior. Spend the afternoon on the hotel terrace while you enjoy a drink and a bite to eat from the restaurant, or retreat to the enclosed backyard for a spot of breakfast before heading out for the day. Make yourself at home in one of the smart rooms, fitted with free wifi, minibar and TV. This modern 4-star hotel stands on an artificial island in Amsterdam’s IJ River, a short walk from Central Station. Stay here to enjoy stylish rooms with mod cons such as flat-screen TVs, an onsite bar, gym, and sun terrace. Set in a grand 17th-century building, this 4-star hotel is ideally located for those wanting to explore the city. Enjoy a drink in the atmospheric Pastorie Bar and dine in the brasserie, serving both Dutch and international cuisine. For business, the hotel has a number of meeting and conference suites. Stylish rooms come with complimentary wi-fi, a minibar and flatscreen TV. Close to leafy Vondelpark, this canal-side 4-star hotel sits in the stylish Oud Zuid district. Amsterdam’s best museums are on the doorstep, while several public transport links provide easy access to the rest of the city. Hotel highlights include a bar, gym, free wifi and an award-winning restaurant. Housed within several historic townhouses, close to the buzzing nightlife of Leidseplein, the exclusive shops of P.C. Hooftstraat, and the Van Gogh museum, this 3-star hotel offers comfort in the heart of the city. Every room has a flat-screen TV and private bathroom, as well as a touch of contemporary style in its smart, but colourful décor. Close to iconic Amsterdam sights, like the Flower Market, Van Gogh Museum and Anne Frank’s House, this modern 4-star hotel is well situated for exploring the city. Relax in comfort with an on-site restaurant and breakfast buffet, as well as air conditioning, free wifi and satellite TV in every room. Set on the busy Rembrandt Square in the centre of Amsterdam, this pet-friendly, 4-star hotel with its beautifully-preserved Art Deco interior is ideally located for visitors wishing to explore the city. You'll be within walking distance of popular museums and galleries such as the Jewish Historical Museum, the Museum Van Loon and Anne Frank’s House. The hotel contains an excellent brasserie, along with meeting spaces and conference facilities for business visitors. The unique historical character of this 4-star boutique hotel, together with its convenient city centre location, make it the perfect stay for all your leisure travel. The hotel is located just a five-minute walk from Central Station, Dam Square and the Royal Palace. The hotel building previously housed 2 monasteries from the 13th & 14th centuries, plus a printing house. Now, the hotel has 148 rooms, including 11 Junior Suites, each with their own history and character. These are the Secret Hotels uncovered in Paris, France (updated February 2018). If there is a certain hotel you cannot find when you click on the links below, please send us an email or leave a comment. This sleek 5-star hotel is found in La Defense, Paris’ business district. Close to the Quatre Temps shopping centre, it’s the perfect base for enjoying the city’s fantastic shops. Back in the hotel you can tuck into authentic French cuisine in the restaurant, workout at the fitness centre and unwind in the hammam. Found in the historical 1st arrondissement, right at the heart of Paris, and a short walk from iconic attractions like the Louvre and Jardin des Tuileries, this 5-star hotel combines traditional Parisian architecture with sumptuous touches of contemporary interior design. The hotel’s restaurant is based in an attractive courtyard, there’s also a high tech gym onsite and great Metro links to the rest of the city. This stylish 4-star hotel is just metres from the Eiffel Tower, one of the world's most iconic structures, making it ideal for sightseeing. It is well equipped for business travellers, with a business centre and theatre style conferencing for up to 400. The hotel also boasts a unique fitness suite, with views of the Trocadéro. Rooms are equipped with free wi-fi, a flatscreen TV and a docking station for audio devices. Dine in the FR/AME restaurant, serving Californian à la Française. Behind a classic Parisian façade, this hotel is filled with characterful, colourful and contemporary design. The hotel has a bar, terrace and a spa, so you’ll find plenty of places to relax and unwind when you’re not out exploring the sights, shops and bars of the surrounding Latin Quarter. Rooms all have contemporary comforts, including the use of an iMac, free wi-fi, air conditioning and private bathrooms. In the heart of Paris’ historic 8th Arrondissement, near the famous Champs Elysees, this 4-star hotel has been welcoming guests since the 1920s. The hotel’s interior décor combines both contemporary and classic French styles to great effect. Rooms are air conditioned and have flat-screen satellite TVs, complimentary wifi and marble-finished bathrooms. This 5-star hotel sits in Paris’ Golden Triangle – a shopping district filled with fashionable boutiques and luxury stores – and is well-located for seeing the city’s sights. Combining classic refinement with contemporary style, the hotel is home to a stylish restaurant and inviting, intimate bar. Each room is furnished with plenty of modern comforts, including fine linens, free wi-fi and a flat-screen TV with international channels. This stylish, 5-star hotel is located in the centre of the Parisian Golden Triangle. Enjoy modern French cuisine and an extensive wine list in the on-site restaurant or relax in the new lobby bar. The contemporary rooms feature free wifi, tea and coffee-making facilities, minibars, and flat-screen TVs. This 4-star boutique design hotel is found in the 16th arrondissement, close to the Seine and transport links, and within walking distance of the Eiffel Tower. Filled with contemporary style and comforts, the hotel has a chic lounge bar, 24-hour reception and a spa and fitness facilities. Rooms include minibars, free wi-fi, flat-screen TVs and private bathrooms. This 4-star boutique hotel is found in the 1st arrondissement, within walking distance of many of Paris’ most famous sights, including the Louvre, as well as fabulous shops and restaurants. The hotel offers a concierge service, free wi-fi and seriously stylish décor. Each room has a flat-screen TV, air conditioning, safe and private bathroom. This 3-star Art Deco hotel sits in the 11th Arrondissement, close to the historic Place de la Bastille. After a night out in the exciting bars of the nearby Le Marais, relax in your room, with free wifi access and cable TV coming as standard. From the outside, this fantastical oasis is a smart Parisian townhouse, step inside and you’ll be greeted by innovative, conceptual design. Next to the Latin Quarter and close to Luxembourg Gardens, there are many chic restaurants and shops to explore. The rooms are individually themed with decadent furnishings to evoke pleasure and romance. Mood lighting and aromatic fragrances help create a relaxing ambience. All are equipped with LCD TVs, Nespresso machines, i-Pod bases and free wi-fi. This 4 star modern aparthotel is the perfect choice to enjoy a stay very close to Paris, with direct and easy access to the city center (Saint Germain des Pres, Notre Dame, etc). Enjoy a great location, close to the metro, and a the free wifi during your stay . This classic 3-star hotel is found in the historic heart of Paris, close to famous department stores on the Boulevard Haussmann and sights like the Place de la Madeline. The hotel is furnished in a classic Louis XV style with enchanting decorative touches, and has a relaxing lobby lounge. Rooms combine period style with modern comforts like air conditioning, free wi-fi, satellite TV, safes and private bathrooms with showers or tubs. Filled with modern-style, this 4-star hotel sits in the 10th arrondissement, near the Grand Rex and the Grands Magasins, as well as plenty of bars and restaurants. Make the most of your stay in the city with the hotel’s concierge services, which can help you book tour and transport tickets and restaurant tables. Each room at the hotel is strikingly decorated, and has free wi-fi, to help you stay connected, as well as a TV and private bathroom. Filled with chic and sleek contemporary design, this boutique hotel offers a relaxing place to stay, within easy walking distance of the Louvre and many of Paris’ other historic sights. The hotel offers a 24-hour reception, with luggage storage and concierge services, and has a stylish honesty bar. Rooms feature attractive décor and plenty of modern comforts, including free wi-fi, flat-screen TVs, rain showers and air conditioning. Found near the Seine, this Latin Quarter hotel combines quintessential Parisian character with contemporary comforts and conveniences, and is well located for both public transport links and a number of the city’s iconic sights. The hotel’s interior design includes both antique furnishings and modern services, including a welcoming reception and a fitness room. Rooms offer iPod docks, wi-fi access and incredibly stylish bathrooms. This contemporary 4-star hotel is found in a former townhouse, close to Paris’ theatre district. During your stay you can dine in the on-site restaurant or enjoy a drink in the jazz-age inspired bar, or unwind with a rejuvenating treatment in the on-site spa. The hotel’s chic rooms are filled with contemporary features, including flat-screen TVs, wi-fi access and private bathrooms stocked with high-quality toiletries. This modern 4-star hotel sits in Paris’ 15th Arrondissement, within walking distance of the Palais des Sports, and metro links to the city centre. The hotel has a breakfast buffet, a cosy bar and offers free wi-fi access. Rooms feature satellite TV, air conditioning and private bathrooms. Located in the centre of Paris, in the 15th arrondissement, this modern property is near the Montparnasse station. The hotel has a restaurant and a bar, with a terrace. The hotel offers you a moment of evasion in its sauna and fitness room. Free Wifi is available everywhere in the hotel. This modern boutique hotel is found in the 11th arrondissement, near Place de la Bastille and the cool Le Marais area. Filled with quirky, artistic style, the hotel’s unique interior design offers an intriguing welcome, and the hotel offers plenty of modern comforts too – including a 24-hour reception, luggage storage, free wi-fi access and an honesty bar. Rooms are cosy and colourful, and offer flat-screen TVs, air conditioning and en-suite facilities with hairdryers. Traditionally Parisian, this 3-star hotel is just a short walk from the Gare du Lyon, and close to the Bastille. Decorated throughout in a modern style, the hotel has a cosy lobby with helpful reception desk and a breakfast room. Each room is air conditioned and has free wifi, satellite TV and a private bathroom. Located in lively Montparnasse, close to the famous Catacombs and Jardin du Luxembourg, this boutique 4-star hotel combines traditional Parisian architecture with contemporary design. With the Metro and Montparnasse train station a short walk away, exploring the city is easy. There are several great bars and theatres nearby, while the hotel itself, with its library and elegant bar, is a great place to unwind. Offering a contemporary take on classic Victorian style, this characterful boutique hotel is conveniently located for exploring Montmartre’s famous sights and nightlife. The hotel has a 24-hour reception service and wi-fi is available throughout. The hotel’s rooms are air conditioned and soundproofed and have satellite TV, safes and private bathrooms. This hotel sits in Paris’ 9th arrondissement, within walking distance of Montmartre, the Moulin Rouge and the Opera Garnier. Among the convenient services the hotel offers are a 24-hour reception, luggage storage, free wi-fi access and a breakfast buffet. Rooms are designed in an attractive, minimalist style and all have TVs and private bathrooms. This modern hotel sits just outside Paris, close to metro links to the city centre’s sights and a short journey from the Porte de Versailles exhibition centre. During your stay you can relax on one of the hotel’s outdoor terraces, or enjoy a workout in the gym. Rooms are furnished in a colourful contemporary style, with free wi-fi, flat-screen TVs and private bathrooms as standard. This stylish 3-star hotel is conveniently located in central Paris, just a 20-minute walk from Montmartre and Sacre Coeur Basilica. Facilities include a 24-hour front desk, a laundry service, a lounge library, and a buffet breakfast is available for an extra fee. The stylish rooms feature free wifi, LCD TVs, tea and coffee making facilities, and private marble and granite bathrooms. Combining classic Parisian architecture with modern interior design, this 3-star hotel is close to many of the city’s fantastic sights and shops, as well as several metro stations. The hotel offers a daily breakfast service, free wi-fi, and a 24-hour reception service. Furnished in a contemporary style, rooms offer flat-screen TVs, ipod docks, safes and climate control. This smart, 4-star hotel sits in Paris’ 14th district, a short walk from the Montparnasse neighbourhood. The hotel serves breakfast each morning, has a 24-hour reception, and there’s free wifi throughout. The modern rooms have sound-proofing, air-conditioning, en-suite bathrooms with free toiletries, tea and coffee making facilities, and satellite TVs. Located in the romantic heart of Paris, only few steps from Sacre Coeur and Moulin Rouge, the hotel is an ode to famous lovers. Rooms are provided with high quality comfort with its own universe to assure a pleasant stay around love theme. A perfect place to stay for lovers who want to be in close to major Parisian attractions. Sitting in the hip 10th arrondissement, and just a short walk from the Canal-Saint Martin, this colourful 3-star hotel is attractively finished with splashes of modern design. The hotel’s air conditioned rooms have HD TVs and free wifi, and the nearby Metro station makes getting around the city incredibly convenient. Take a short walk down to Oberkampf for a great choice of trendy bars, boutiques and galleries. This contemporary aparthotel sits near La Villette park, home to the Zenith and Philharmonie concert halls and Cite des Sciences. For your convenience the hotel offers a 24-hour reception service and free wi-fi throughout, as well as a fitness room. All accommodations offer a kitchen area, TV with international channels and private bathroom. Filled with vintage style, this 3-star hotel includes art deco features that date back to the 1930s, and is found within walking distance of sites like the Moulin Rouge and Sacre Coeur. Unwind in the hotel’s lounge, or the bar. Rooms are decorated in a classic style, and include satellite TV and private bathrooms. Conveniently located by several metro stations, this smart hotel sits in the 11th Arrondissement, within walking distance of famous sights like the Place de la Bastille. The hotel has a breakfast room and parking – both available for an additional fee. Rooms offer satellite TV, free wi-fi and private bathrooms. Nice location for this hotel set in an unusual and interesting part of the 17th arrondissement. From there, you can reach all the main attractions of Paris and walk to St Lazare and the department stores. The hotel offers well appointed rooms, decorated with flowery wallpaper in pure Parisian tradition. This 4-star hotel is ideally located if you're looking for accommodation outside of central Paris with great links into the city. A stay here will place you within the new Faubourg de l'Arche neighbourhood, close to the CNIT convention centre, Esplanade shopping centre and La Défense business district with its huge range of shops and dining options around the spectacular Grande Arche monument. Your fully air-conditioned apartment comes with parking and a 24-hour concierge service. Situated in the elegant Opera district, and within a short walk of the Louvre, this 4-star hotel, housed in an 18th century mansion, is conveniently located for taking in the sights of the city. With its lounge, complete with fireplace, and soundproofed and air-conditioned rooms, it’s an ideal place to relax in the heart of Paris. Enjoy a drink on the hotel’s terrace, overlooking the Palais Royale. Located in the cosmopolitan district of Republique, with fantastic transport links from the nearby Gare du Nord and Gare de l’Est stations, this 4-star hotel is decorated throughout in an attractive and subtly contemporary style. Every room has air conditioning, satellite TV and private bathrooms with tubs. The hotel also has several living rooms, which are comfortable spots to take advantage of the free wifi, and a hammam and sauna. This 4-star hotel sits on a quiet street in the 16th Arrondissement, close to sights like the Arc de Triomphe and the Eiffel Tower. Combining classic and contemporary styles, the hotel’s colourful surroundings make for an attractive place to relax from the bustle of the city, with an on-site bar and lounge, and free wifi access, satellite TV and air conditioning in every room. In Paris’ 8th Arrondissement, this 4-star hotel brings contemporary interior design to an attractive Haussmann building; indicative of 19th century Parisian style. A short walk from the upscale shops, bars and cafes of the famous Avenue des Champs-Elysees, and with convenient transport links, this hotel is a great base for exploring the city, with LED satellite TV and free wifi access coming as standard in every room. This contemporary 4-star hotel offers intrigue and style throughout its public spaces and rooms. It is just a couple of minute's walk to any of three Metro stops, meaning navigating the city is quick and easy. Atmospheric rooms have an iPod dock, a flatscreen TV with multilingual channels, complimentary wi-fi and air conditioning. Suites have extra space and the addition of a Nespresso coffee machine. Dine in Eugène's Cantine, serving a buffet breakfast and meals throughout the day. This boutique 3-star hotel is located in Paris’ 14th Arrondissement, an area that’s home to plenty of literary history, a host of great bars and restaurants, and the city’s theatre district. The hotel has kept many of its original period features, while also offering modern comforts like complimentary wifi, air conditioning and flat-screen TVs in every room, and an on-site breakfast buffet and lounge bar. Found near the iconic Paris Catacombs in Paris’ 14th Arrondissement, this contemporary 4-star hotel is close to some of the city’s most exciting nightlife, and has excellent transport links nearby for getting around the city. The hotel’s bar and restaurant specialises in modern cuisine, wines, coffees and cocktails, and there is also a breakfast buffet every morning. Rooms are relaxing spaces, with complimentary wifi, air conditioning and private bathrooms with tubs. Located by the Champs Elysees, in one of the most luxurious area of Paris, this beautiful Parisian building has retained the discreet charm of a traditional town house. Walking distance from the mains Paris attractions like Arc de Triomphe and Eiffel Tower, rooms are quiet and elegantly decorated, offering you a relaxed and memorable stay. This contemporary 4-star hotel sits in the heart of the business district. Offering panoramic views of the Seine and the Eiffel Tower, the hotel is only a short metro ride from the centre of Paris. You can fill up on a buffet breakfast each morning, dine in the restaurant, relax with a drink in the bar, workout in the gym, and stay connected using the free wifi. Contemporary rooms have air conditioning, free wifi, tea and coffee making facilities, and LCD TVs. Located in the Montmartre district in Paris, a 10-minute walk from Sacré-Coeur Basilica, the hotel offers fully equipped rooms with free Wi-Fi access. Metro station closed to the hotel gives direct access to Saint-Lazare and Montparnasse. Renowned for its friendly, welcoming staff, this 4-star hotel in Paris is great for business and pleasure trips to the city. Smart and affordable rooms are decorated in soft tones, and are fitted with convenient complimentary wi-fi access, LED TV and air conditioning to ensure your stay is as comfortable as possible. At the end of the day, there’s no better place to relax than the hotel’s quaint pool and sauna. Make sure you try out the hearty buffet breakfast available before you head out. Transport yourself back to the elegance and grandeur of 18th-century Paris with a stay at this beautiful, boutique, 4-star hotel. Full of historic features, the hotel has an old-world charm. Each classically styled room is fitted with air conditioning, a minibar, satellite TV and free wi-fi access so you can stay connected during your stay. Socialise with friends at the hotel bar and lounge before heading out to one of the city’s many restaurants. This modern 4-star hotel, overlooking the Seine, is in an ideal central location, only a short walk from the Eiffel Tower. Breakfast is available at the hotel, you can enjoy a drink in the bar and there are plenty of restaurants nearby for dinner. En-suite rooms come with air-conditioning, LCD TVs and free wifi to keep you connected. Found in an exclusive and historic part of the 17th Arrondissement, and within walking distance of the Champs Elysees, this 4-star 1930s hotel is full of Art Deco charm. In each room you’ll find high-tech touches like Nespresso machines and free wifi access, and the hotel also has an attractive restaurant and inviting bar. Found in one of Paris’ most cosmopolitan areas, and close to Montmartre, the city’s famous artistic district, this 4-star hotel brings eye-catching contemporary design to a historic location. Exploring the city is easy, with the well-connected Gare du Nord a short walk away. Enjoy gourmet cuisine in the hotel’s restaurant, work-out in the gym or indulge with a relaxing massage. Have a drink in the incredible ice bar, cool in every sense of the word. This hotel, in the residential quarter of Paris, is just a few moments from the historic Eiffel Tower and not far from the Champs-Élysées. Simple, cosy rooms have all the necessary comforts, including air conditioning, LCD TV, free wi-fi access and minibar. Before heading out into the city, fuel up with the hotel breakfast, taken on the quaint little terraced garden. In fashionable Batignolles, part of Paris’ 17th Arrondissement, this colourful 4-star boutique hotel sits near the Arc de Triomphe and the famous Avenue des Champs Elysees. Complimentary wifi access is provided within every one of the hotel’s well-equipped rooms, as well as a TV and private bathroom, to make your stay as pleasant as can be. This boutique 4-star hotel sits in the Montmartre district, close to the Moulin Rouge. You can tuck into a buffet breakfast each morning and snacks and drinks are available at the bar. The hotel has a fitness centre and sound-proofed rooms come with air-conditioning, LCD TVs, and free wifi. Based in the affluent arrondissement de Passy, Paris’ 16th district, this modern 4-star hotel is just a short stroll from the banks of the Seine, well connected by Metro and express RER train, and within walking distance of the Eiffel Tower. Each of the hotel’s rooms has satellite TV and a private bathroom. Located just a short walk from the Grande Arche de la Defense, near the shopping centre 'Les Quatre Temps' and approx. 15 minutes from the centre of Paris (metro line 1). This five star hotel offers up scale accommodation, that is welcoming, comfortable and provides the technology you need, in order to stay in touch with friends. Openness and a graceful game of lights characterise the rooms, in which all elements work in harmony, to maximise your well-being. Shopping 7 days a week ! Set within the leafy Parisian neighbourhoods of Neuilly and Levallois, this modern 4-star hotel is a great option for relaxing in style. The Espace Champerret Exhibition Space and the La Défense business district are close by, along with major sights such as the Arc de Triomphe and the Bois de Boulogne public park. A nearby Metro stop makes exploring the city a breeze. Stay in shape by visiting the hotel's fitness centre, or perhaps sample some French cuisine in the restaurant and bar. Found in the traditionally Parisian surroundings of the 15th Arrondissement, and within walking distance of the Eiffel Tower, this 4-star hotel is filled with striking contemporary style. Treat yourself at the breakfast buffet served in the hotel’s attractive dining room, or to the room service menu in the evening. Each contemporary-styled room has air-conditioning, a flat-screen TV, private bathroom and wifi access. Located in affluent and traditional 17th arrondissement, and very close to the Metro, connecting you with the famous sights of the city, this 4-star hotel has a real sense of contemporary design, and centres on a peaceful interior garden. Every room has a flat-screen TV with satellite channels, free wifi and a private bathroom, and the hotel’s bar is a great place to relax with a drink. Found in the heart of the up-and-coming 13th arrondissement, this 4-star hotel is designed with a real contemporary feel, with cool, eye-catching decor running through the bar and the air-conditioned rooms. Great nightlife and restaurants surround the hotel, and the Seine, the hip Latin Quarter and the metro are all within walking distance. Wander along the Boulevard l’Hopital to visit Butte-Aux-Cailles, home to charming cafes and restaurants. This quaint 4-star hotel stands in Paris’ Montparnasse district, more commonly known as the artists’ district. Colonial-styled, the hotel is littered with lovely plants, mahogany furnishings and is full of natural light. Each of the rooms has a stylish retro bathroom, as well as minibar, LCD TV and air conditioning. Start your day with a hearty breakfast in the breakfast room, or relax in the lobby and catch up on affairs with the complimentary newspapers available. This modern 4 star hotel is near the Porte de Versailles station, making it easy to explore the sights of Paris. The hotel serves a buffet breakfast each morning, and you can treat yourself to a drink and light bite in the cool on-site bar. Each contemporary-styled room has air conditioning, satellite TV and free wifi access. With spacious rooms, games and activities for children, fitness center, private car park, restaurant, bar… the hotel offers a moment of serenity and well-being. Very close to the Montparnasse train station, in the heart of the cultural and vibrant area of Montparnasse, very easy access by subway to the major sights: Eiffel Tower, Saint-Germain-des-prés... Rates based on standard room, double occupancy, room only, 1 child free in parents room. This modern 4- star hotel sits in the heart of Paris’ fashionable Montparnasse, with its restaurants and theatres. Nearby transport links keep you connected to the rest of the city. The restaurant serves up seasonal-inspired meals, you can relax in the lounge bar, and the free wifi will keep you connected. This modern 4-star hotel is a short walk from the iconic Eiffel Tower and moments from the romantic riverside bars in Paris’ prestigious 16th district. You can head out to explore nearby Rue de Passy, full of boutique shops and cafes. Back at the hotel, you can relax at the bar, garden and terrace; and make use of the free wifi. Situated in the 17th arrondissement, an upmarket area that showcases some of the best of Paris’ historic architecture, and close to the peaceful Parc Monceau, this contemporary-styled 4-star boutique hotel is well connected to the city’s famous sights. Sleekly designed, all rooms have colourful soft furnishings and hardwood floors, as well as cable TV, dining areas and private bathrooms. This modern 4-star hotel is found near Bibliotheque Francois Mitterrand Metro station in the 13th arrondissement. This is one of the more traditional Parisian districts, where you’ll also find lively Chinatown. You can relax at the lounge bar and terrace or retreat to your luxury suite. On a quiet street near the historic and trendy La Marais district, this modern 4-star hotel is decorated in a colourful but classic style. The hotel offers free wifi access, a bar and fitness room, while its air conditioned rooms are fitted with satellite TV and private bathrooms. Situated in La Défense, Paris’ vibrant business district, this contemporary 5-star hotel is close to the impressive CNIT conference centre and Grand Arche de la Defense, and well-connected to the rest of the city by the nearby Metro station. Enjoy gourmet Mediterranean cuisine in the hotel’s restaurant, a drink in its plush bar or work-out in the fitness centre. This modern 4-star hotel is found near the River Seine and Parc de Percy in south-east Paris. It’s a bustling area with plenty of restaurants and shops. Alternatively, you can dine at the hotel restaurant and grab a drink in the bar. You can also enjoy the sauna, fitness centre and free wifi. Conveniently situated in the central 9th arrondissement, close to the elegant Opera district, this 4-star hotel evokes its historic location with a real sense of baroque style. All rooms have air-conditioning, free wifi and private bathrooms. The nearby Metro station connects you with the sights of the city, and the famous shopping of the Grand Boulevards, the grand Palais Royal and the Louvre are all within walking distance. Conveniently located in the central 9th arrondissement, at a walking distance from the elegant Opera district, this 4-star hotel evokes its historic location with a real sense of baroque style. All rooms have air-conditioning, free wi-fi and private bathrooms. The nearby Metro station connects you with the sights of the city, and the famous shopping of the Grand Boulevards, the grand Palais Royal and the Louvre are all within walking distance. Enjoy a romantic getaway with a stay at this contemporary 3-star hotel in Paris. The hotel has a unique design, with rooms individually decorated in bright colours and mood lighting. Choose a room with a bed suspended in the air if you want to try something new, or book a suite with its own outdoor Jacuzzi for a bit of added luxury. Each room is equipped with air conditioning, free wi-fi access and flatscreen TV. In the Latin Quarter of Paris, the hotel is well placed for exploring the city. In the heart of Paris, overlooking the Seine and close to the Eiffel Tower. You will enjoy a warm service in this 4 stars modern hotel. You'll find areas for relaxing as a couple or with your family and places to work, along with numerous other first-rate amenities. Rates based on standard room, double occupancy, room only. This modern, 4-star hotel, overlooking the Seine is within walking distance of the Eiffel Tower and the Trocadéro. You can take a dip in the hotel’s indoor pool, workout in the gym, relax with a drink in the bar, dine at the hotel’s two restaurants, and logon using the free wifi. Each of the contemporary rooms has air-conditioning, a flat-screen TV, fridge, en-suite bathroom, and free wifi. Situated in the historic region of Saint-Germain, close to iconic spots like the Notre Dame Cathedral and the Jardin du Luxembourg, the architecture of this 4-star hotel is quintessentially Parisian, with classically smart décor throughout. Every room has free wifi, satellite TV and a private bathroom, and there are several Metro stations in the nearby area, making it easy to explore the city. A good choice for travellers looking to explore the city at their leisure, this modern 4-star hotel is found in Montparnasse, an area known for its literary and artistic heritage, a short walk from the tranquil Jardin du Luxembourg, and close to several Metro and RER stations for exploring the city with ease. The hotel serves a tempting breakfast buffet, and in each room you’ll find satellite TV and marble-finished bathrooms. This stylish, 5-star hotel is situated in Paris, just 200 metres from the Arc de Triomphe and the Champs-Elysées. Its facilities include private on-site parking, a bar and outdoor terrace, and a gourmet restaurant. Rooms are decorated in a contemporary style and feature flat-screen TVs, minibars, and coffee and tea making facilities. Found near the exciting areas of Montmartre and Pigalle, home to the Moulin Rouge, this 19th century 4-star hotel has an inviting rococo style décor throughout. Rooms have complimentary wifi access and private bathrooms with tubs, and you can enjoy a delicious breakfast buffet in the hotel’s dining room, or a refreshing drink in its lobby bar. Exploring fashionable Paris is straightforward from this chic, centrally located hotel. You won’t need to walk far to find a Metro station, and there’s plenty for you to discover on foot. The venue’s distinctive styling adds another element to your stay, while a fitness centre with gym is a welcome addition. High-speed wi-fi can be accessed in the rooms and everywhere else, with a flatscreen TV, smartphone connectivity, minibar and air conditioning also included. Found in Paris’ trendy 7th Arrondissement, this contemporary 4-star hotel sits on the left bank of the River Seine, and is close to must-see sights like the Musee d’Orsay and the Jardin de Tuileries. Each room has a private bathroom, iPod dock, flat-screen TV and free wifi, and the hotel’s lounge bar serves a tasty breakfast buffet. This 4-star boutique hotel is located on the banks of the river Spree and only a short walk from Oberbaumbrücke. Enjoy a work-out in the hotel’s modern gym or unwind in the extensive spa area. The hotel’s restaurant, offering a buffet breakfast, lunch and dinner, includes a terrace overlooking the River Spree. All rooms feature air conditioning, a flat-screen TV with USB port, and tea & coffee making facilities. This modern 4-star hotel sits near in the Wilmersdorf, known for fantastic shopping. The hotel has a gym, a cosy bar and free wifi; while staff are happy to offer advice on sight-seeing tours and getting around Berlin. Found in 19th century building in Berlin’s Halensee district, this hotel is close to the famous Kurfurstendamm and the Funkturm Tower. Among the hotel’s convenient features are a 24-hour reception service and free wi-fi throughout the building. Rooms offer modern features like minibars, safes, cable TV and private bathrooms. In a quiet location on the banks of the River Spree, this 4-star hotel has a garden, free wi-fi throughout and a restaurant with a terrace. Families are well catered for with a kids’ menu, kids’ toiletries in the rooms, and extra beds, cots and connecting rooms all available. There’s a free 24-hour gym, a sauna, room service and a bar serving snacks and cocktails where you can watch sport on TV. All 126 rooms have air conditioning, a choice of pillows, a minibar and a flatscreen cable TV. Found in a peaceful part of town, this modern 4-star hotel is just a short train ride from the bustling heart of the city, ideal for taking in the sights. The restaurant serves traditional local cuisine, and there's also a sauna on-site. Rich colour accents give each room a sense of warmth, and all are fitted with private bathrooms, air conditioning and free wifi access. Enviably positioned in the west of Berlin close to Kurfürstendamm shopping street, a stay at this hotel puts you within walking distance of the Kaiser Wilhelm Memorial Church and Berlin Zoo. Keep in shape at the on-site fitness centre, featuring a fully equipped gym, sauna, steam room and indoor pool. Ask at the front desk for guided tours of the city or for bike rental, and after a day spent exploring Berlin return to Portuguese cuisine with a German twist at the elegant Restaurant NAU. Ideally located for Berlin’s Christmas markets, as well as concert halls and museums, this 5-star hotel sits near Gendarmenmarkt square, and is well-connected to the city’s sights by local transport links. Combining 18th century architecture with contemporary style, the hotel is home to an elegant restaurant and bar, as well as a state-of-the-art gym and relaxation facilities. Rooms offer contemporary comforts like air conditioning, marble-finished bathrooms and free wi-fi. Found in vibrant Mitte, one of Berlin’s trendiest neighbourhoods, this elegant and classy hotel sits near the Nordbahnhof station and the Museum für Naturkunde, and is close to an excellent selection of bars, shops and restaurants. You can enjoy an exquisite potpourri of cuisines in the on-site restaurants and relax in the dashing bar. Rooms are furnished in a delicately contemporary style, with flat-screen TVs, air conditioning, free wi-fi and private bathrooms with rain showers as standard. This contemporary 4-star hotel is ten minutes from Spandau's Old Town and has excellent transport links from the Berlin-Stresow Train Station. Traditional German cuisine is served at the restaurant alongside international dishes and panoramic views. The hotel's minimally-styled rooms have attractive touches of colour, and satellite TVs, air conditioning and en-suite bathrooms as standard. On the brim of leafy Tiergarten, this 4-star design hotel comes equipped with elegantly appointed airy rooms and free wifi throughout. The exquisite spa area includes an indoor pool and a sauna. Boasting an extensive outdoor terrace, the hotel restaurant serves a dedicated selection of classical dishes with the neighboring bar offering typical Berlin snacks. All of the bright rooms are equipped with natural wooden floorboards, floor-to-ceiling windows, luxuriously comfortable bedding and a modern bathroom with rain shower and heated floors. Berlin Zoo, KaDeWe department store and Berlin are all in reach within a short stroll. Centrally located, this modern 4-star hotel is close to the bustling Alexanderplatz Square, making it a great place to get a real feel for Berlin. Both local specialities and international favourites can be enjoyed in the on-site restaurants, and there's also a spa where you can relax after a day in the city. Every one of the hotel's rooms has air conditioning and marble-finished bathrooms with rain showers. This modern 4-star hotel is found in Berlin’s trendy Friedrichshain district, close to public transport links, the river Spree and some of the city’s best nightlife. On-site you’ll find an inviting bar and restaurant, serving a refined modern menu, and a gym. The hotel’s rooms offer free wi-fi, TVs with international channels and private bathrooms. This hotel in centrally located in the historical part of Berlin Mitte, next to river Spree. Museum Island, Alexanderplatz or the famous Friedrichstrasse are an approx. 10-minute walk away. The hotel offers international cuisine, elegant air-conditioned rooms with free Wi-Fi, TV and private underground parking. A rich buffet breakfast is available each morning as well as bikes to rent. Please note that dogs are welcome, for an extra fee (10,00 € per day). Right at the centre of buzzing Mitte, this 4-star hotel brings contemporary style to an historic location. Free wifi is available throughout the hotel, and the hotel's bar and restaurant serves classic favourites in cool surroundings. Each room is decorated with subtle splashes of colour and is fitted with a flatscreen TV, air conditioning and private bathroom, to help you relax in comfort. This cozy 3-star hotels sits in a quiet corner away from the buzz of Berlin's popular Mitte district between Alexanderplatz and Potsdamer Platz. All of the elegantly decorated rooms come in bright and warm tones and feature flat-screen TV with free Sky Cinema channels, individually controlled air conditioning and a walk-in shower. Complimentary wi-fi is available throughout. Enjoy a quick start into the day with a dash to the sumptuous breakfast buffet and let the day go with a signature drink at the hotel's cozy lobby bar. Bustling Kreuzberg and elegant Friedrichstrasse shopping are both a short 10-minute stroll away. Full of contemporary interior design, this 4-star hotel at the heart of the trendy Mitte neighbourhood is a great starting point for exploring the city's sights and nightlife. The hotel's restaurant serves both local and international dishes, so you'll be bound to find something to tempt your tastebuds, and the 24 hour fitness centre is stocked with high-end equipment. Free wifi is available throughout the hotel, and each room is warmly decorated and fitted with a flat-screen TV and an en-suite bathroom. This modern 4-star hotel is conveniently located in the trendy area of Charlottenburg, Berlin, close to cultural gems such as the Charlottenburg Palace. Inspired by the artwork of Pop Art legend Andy Warhol, the interior design is contemporary and comfortable, with free wi-fi and cable television in all rooms. This Trip Advisor Certificate of Excellence winner also offers a well-equipped on-site gym, sauna and relaxation area, with a ‘shower route’ to help you unwind. This 3-star hotel sits in Schoneberg, close to the Winterfeldt Market, and U and S-Bahn services. The hotel offers free wi-fi and 24-hour reception service, and is close to a great selection of bars and restaurants. Rooms are furnished in a contemporary, minimal style, with flat-screen TVs with satellite channels, air conditioning and private bathrooms. Right in Berlin's lively Mitte district, this modern 4-star hotel is very close to the Kochstrasse underground. Relax in the bar after a long day in the city and enjoy a bite to eat on the terrace. Free wifi access is available in every room, and each one has a flat-screen TV and an en-suite bathroom. This arty hotel is strategically located in one of the trendiest neighbourhoods of Berlin filled with boutiques, restaurants and art galleries, and close to landmarks like the Berlin Zoological Garden and Kurfurstendamm Boulevard. It offers bright, air-conditioned rooms and a buffet breakfast each morning. Please note that dogs are welcome, for an extra fee (10,00 € per day). A contemporary 4-star hotel in Neukolln with a real sense for the spectacular. Among the on-site entertainments you'll find a spa to relax in after a long day out, and a selection of tempting restaurants and bars, including a beer garden. The rooms mix contemporary and natural furnishings and have free wifi, satellite TVs and private bathrooms. Flooded with natural light thanks to its large glass atrium and floor-to-ceiling windows, this modern 5-star hotel is right in the centre of Berlin, on one of the main shopping streets. As well as a heated pool, fitness centre and sauna, this TripAdvisor Certificate of Excellence winner has a restaurant, a café-bar, a business centre, room service and a prodigious hot and cold breakfast buffet. All rooms have an LCD satellite TV and air conditioning; triple rooms, suites and cots are available. Centrally located near Gendarmenmarkt square, the contemporary 4-star hotel has a great sense for minimalist interior design. You'll get the day off to the right start by enjoying the hotel's buffet breakfast on the terrace, and the bar is a great place for a nightcap. flat-screen TVs and free high-speed internet access can be found in all rooms, and wifi access is also available in the hotel's cool lobby. 19th century country house between London and Watford, part of the Best Western Plus brand, offers rooms at £ 20 for the night of 3 August 2016, flexible rooms, without breakfast. You can choose the breakfast inclusive rate for additional £ 10 per person (single or double occupancy options available). Remember to share this deal with your friends. 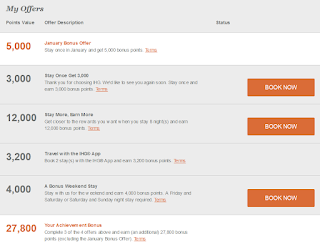 IHG Rewards, the loyalty programme of Intercontinental, Crowne Plaza, Holiday Inn hotels, runs a new promotion until April 2016. If you are not yet a member of the IHG Rewards programme you can register for free following the same link from above. How does it work: each member receives a personalised offer, based on his pattern of previous stays. Each offer is composed of a number of challanges which need to be completed in order to earn over 50 000 bonus points. - with this week-end stay we would have completed also 3 out of the 4 challenges (except the "Stay More" bit) and we'll get additional 27 800 points. Thus, a total of 43 000 points for just 3 nights stayed. A really good deal, considering that with the "Point Breaks" deals you pay only 5 000 points per night. Recurrent RatesToGo promotional codes are available throughout 2016 for hotel discounts worldwide. Currently the RatesToGo promo code 20% and we will keep this post updated throughout 2016 for to reflect current RatesToGo discount codes. RatesToGo is part of the Orbitz group, which means that getting a discount from RatesToGo is the same as getting a discount from ebookers, HotelClub or Orbitz. The RatesToGo voucher code must be typed in the field "Promotion code", at the top of the payment page, immediately above the credit card information. Disclaimer: sometimes the hotels or travel agencies do not honour the rate and might try to get out of it. For us the rate of success has been about 50% - 50% so far.